Anyone who hasn’t been to Cardiff recently will be pleasantly shocked – particularly if they head towards Penarth and the waterside developments that are springing up around the city. Close to the new International Sports Village which will boast some of the finest sporting venues in the UK when they are completed, you will find Cardiff Pointe – a superb development of homes and apartments, close to the sea, yet just a reasonable stone’s throw from the centre of this revitalised city. The first two phases of Cardiff Pointe are being built by Kier Group on behalf of Figurehead Homes and are the result of exciting design work undertaken by the project team on the development – led by Cardiff based architects Scott Brownrigg. Built to a very high specification, a visit to the showhome close to the marketing suite begins to reveal why this development is already attracting huge interest both as a place to live and a place to invest in. The interiors have been carefully thought through to provide light and airy space with quality fixtures and fittings and a design theme that flows through the whole home with strong sharp lines and edges – through the doors selected to the radiators – the Compact with Style designer radiators from Stelrad. 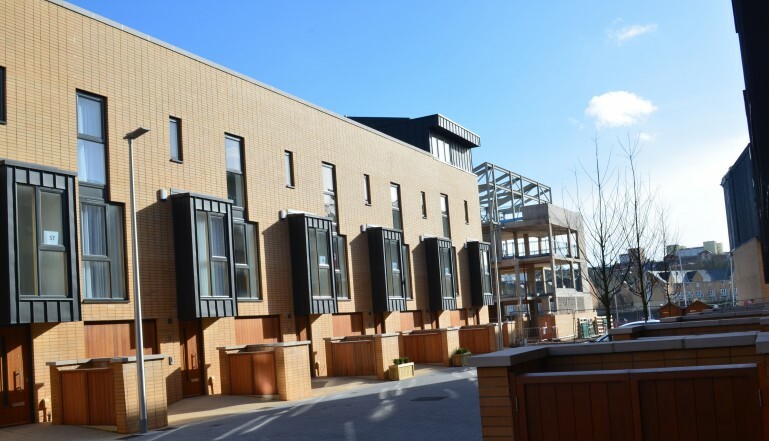 The first two phases at Cardiff Pointe will provide 98 units – a mix of three storey townhouses and apartments – and Stelrad is providing around 700 radiators for these homes alone. 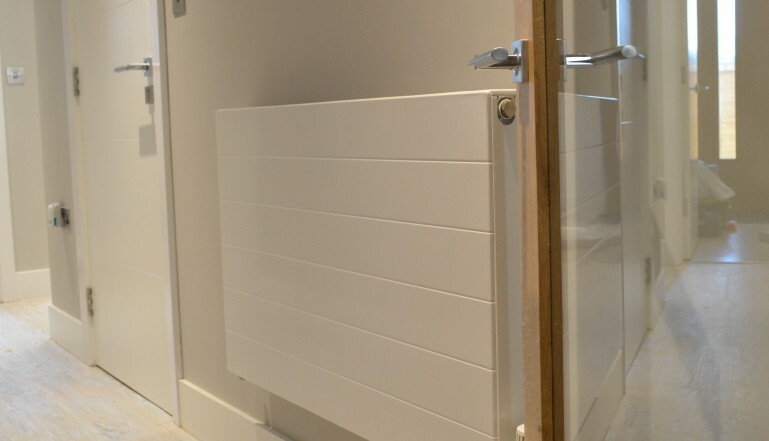 The selection of single panel radiators with a single fin, is an interesting one, design driven – to ensure good looking, slimline radiators that sit close to the walls – but this is also in line with the heating requirements of new homes that are superbly insulated and designed to retain heat particularly in the colder months of the year. 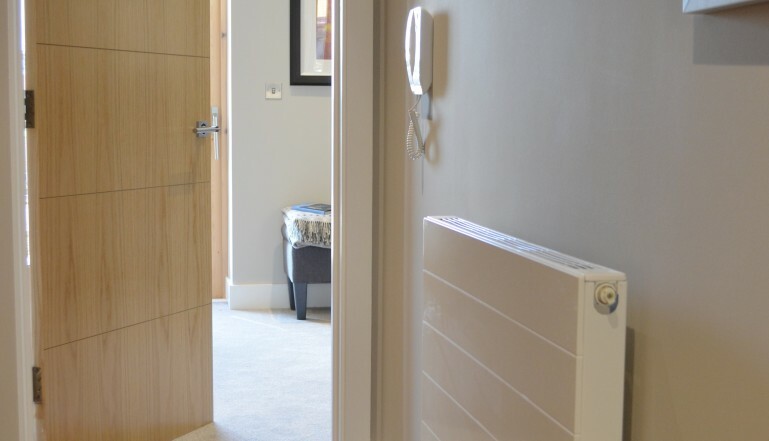 The sizes of the radiators in each room also highlight the increased energy efficiency and effectiveness of modern radiators – highlighting the issues with the massive elderly radiators that tend to adorn pre-2000 built properties. Compact with Style is just one of Stelrad’s designer radiator options, that are increasingly being specified by architects and building designers when standard panel radiators do not meet the higher values demanded of top notch developments up and down the country. To see more about Cardiff Pointe, go to www.cardiffpointe.co.uk. For more information on these stylish radiators, simply head for stelrad.com – you’ll be surprised how far radiators have come…..
A Stelrad Compact with Style radiator in the hallway of one of the homes. Another Stelrad Compact with Style adding a little extra to these high quality homes.